This spring the Alberta Association of Architects is hosting its annual professional development symposium in Edmonton, Alberta. Innovia has been selected to present three business-focused sessions for participants. 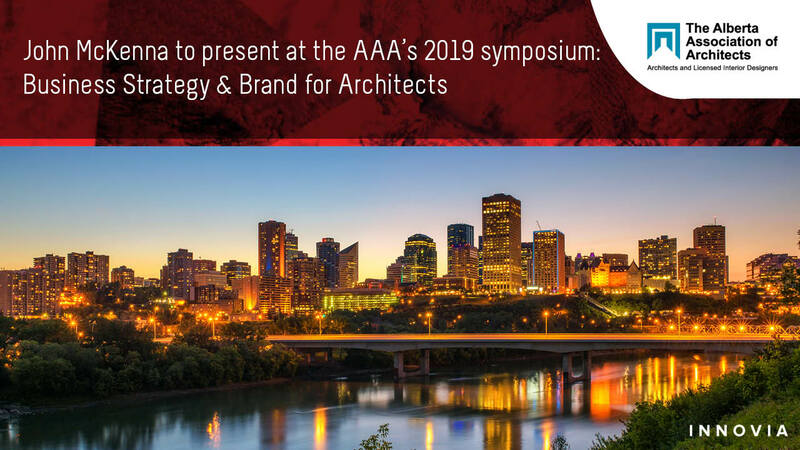 Business Strategy for Architects and the Value of Brand Differentiation for Architects will be presented by John McKenna, and the third by Russell Pollard. Innovia is thrilled to bring our programming and knowledge to the AAA’s event and share our insights with attendees. We work across Canada and in the United Kingdom with practices at varying stages, supporting them through high growth periods, succession and other forms of change. Architectural practices compete with ideas, delivery and solutions. Practice leaders can apply strategic tools to increase their firm’s project design quality and profit. Participants in this session will learn approaches for winning work and growing profitable practices in strategic ways. Principles for business strategy will be presented, coupled with how business structure, culture, and investment can be managed to improve creative and commercial performance. This session is geared to help owners improve their ability to compete and build profitable, sustainable businesses. As the competitive nature of our industry increases, so does the importance of branding. A strong and compelling brand can attract profitable projects and clients in line with the firm’s, or individual’s, talents and creative ambitions. This session will help leaders of architectural practices and individual architects understand principles of branding and how to identify/develop a brand that creates value for themselves and their clients. Participants will be introduced to the business systems that need to be developed, implemented, and sustained to consistently deliver on their brand promise. John McKenna is a Management Consultant with Innovia Partners. He has a decade of experience working as an architect for design-led practices such as gh3 in Toronto where he worked on the Castle Downs Pavilion project and recently opened Borden Park Natural Swim Experience in Edmonton. Before this, he worked on the Grand Egyptian Museum project with Heneghan Peng Architects (Dublin). During his masters degree, John investigated the unique characteristics of design-focused companies. John holds an International MBA from IE Business School in Madrid and a Bachelor of Architecture from the University College Dublin.